Streamlining, a uniquely American style of consumer design, was plucked out of the skies in the Depression era, and things have never looked the same since then. Smooth lines and rounded curves of airplanes, ships and automobiles had the practical purpose of reducing wind resistance and bolstering speed. That these vehicles were also pleasing to the eye wasn't lost on designers of mass-produced goods who were looking for ways to encourage hard-pressed Americans to spend money in the 1930s. Streamlining was quickly used in furniture, kitchen appliances, office equipment, machinery and recreational supplies. Presto! Everything got curvy. "American Streamlined Design: The World of Tomorrow" focuses on the style's affect on almost every facet of U.S. life from the 1930s to 1950s, and on its resurgence in the 21st century. Some 180 utilitarian objects arrayed over three floors have turned the Bard Graduate Center for Studies in the Decorative Arts, Design and Culture into a kind of old-time Sears department store. Nostalgia reigns in the exhibit that opened Thursday and runs to June 11. It is described as the "most comprehensive exhibit ever mounted" on streamlining. 2The sleek but quaintly dated household goods include vacuum cleaners, hair dryers, irons, juicers, mixers, lounge chairs, sleds and scooters, tabletop radios and clocks, portable typewriters, tape dispensers, power saws, box cameras, outboard motors, 33 rpm record players and juke boxes. Most of these objects look as if they're in usable condition, from a 1933 turnstile of the type used at movie theaters and sports arenas, or movie projectors favored by amateur filmmakers before television took over. Office essentials dating from the '30s, such as clear-tape dispensers, staplers and wall-holders for the paper cups at the water cooler, have never gone out of style. 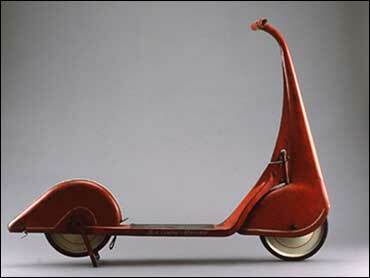 Renowned designers represented include Norman Bel Geddes, Raymond Loewy, Henry Dreyfuss, Kem Weber and Walter Dorwin Teague. Metal, plastic and ceramics are the main materials they used. Curator David A. Hanks explained that leading exponents faced harsh criticism from Bauhaus modernists who declared that streamlining without function was an outrage. "The desire to make objects look 'up-to-date' by borrowing forms from unrelated modern machinery often leads to absurdities such as this pencil sharpener streamlined to resemble an airplane," the show's brochure notes, quoting from a 1944 catalog from the Museum of Modern Art's exhibition, "Design for Use." 3A wall board reminds visitors that streamlining is noticeable in today's stylish consumer goods, such as sneakers and wet suits, whose designs underline "speed and dynamic action." It says that streamlining appeals to optimistic thoughts about the world of the future. Most of the objects are on loan from the Eric Brill Collection of U.S. manufactured goods housed at the Montreal Museum of Fine Arts. The wealthy New York collector researched much of the design background from U.S. Patent Office information, the organizers said. The exhibit was first shown in Billancourt, France, last year, then traveled to the Georgia Museum of Arts in Athens. Other stops over the next three years include the Montreal Museum of Fine Arts in 2007, the Montgomery (Ala.) Museum of Fine Arts, and the Chicago Historical Society in 2008 and the Wolfsonian-Florida International University in Miami in 2009.